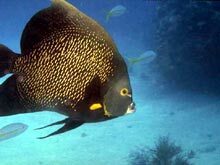 Following are just a few of the dive locations Florida Keys Dive Center has visited over the years. Some are even officially named after the staff as they have been around that long! 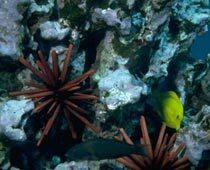 Hen and Chickens: (5-25 ft.) Beautiful peaks and mounds of star and plate coral. Better visibility in the summer at this near shore reef. Pete’s: (12-20 ft.) Series of patch reefs with excellent soft and hard coral, plenty of fish life and noted for the nurse sharks. Pillar Coral: (15-25 ft.) Beautiful stands of rare pillar coral and numerous small fish. Spanish Lady: (15-25 ft.) An area along Little Conch which provides a series of ledges. Excellent for juvenile fish life plus great lobstering. Spiegel Grove: The first thing sport divers notice about the Spiegel Grove wreck is its immensity. Because the Spiegel Grove measures 510 feet from stern to bow, on even the clearest days it will be impossible to view the entire hull from end-to-end. “Imagine a ship lying along the bottom that’s almost two football fields long. That’s the Spiegel Grove,” said Miami scuba enthusiast Jerry Apple, a veteran wreck diver who explored the ship soon after its June 2002 sinking. 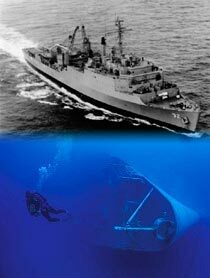 The retired Navy transport ship was intentionally sunk six miles off Key Largo to form the backbone of a coral-reef ecosystem. It is the largest ship ever intentionally sunk for that reason. The algae, sponges and corals that are slowly enveloping the Spiegel Grove are wondrously natural. The ship is home to legions of fish from tiny tropicals to large barracuda and jacks. USCG Duane & USCG Bibb: Two 327 ft. Coast Guard Cutters donated as an artificial reef in 1987 and lay within 200 yards of each other. The Duane wreck lies upright in 118 feet of water while her sister-ship the Bibb lies on her side in 120 feet of water. They are both home to hundreds of fish. The Eagle: The 287 foot freighter was donated by the Eagle Tire Company as an artificial reef in 1985 and has become the home to many different underwater inhabitants; tarpon, jacks, an occasional dolphin and goliath grouper, and thousands of bait fish. Lying on her starboard side the wreck begins at 76 feet and drops to 112 feet in the sand.